_Welcome to my website. 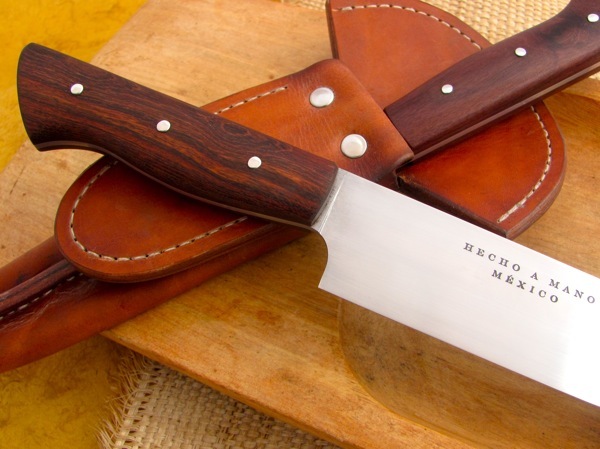 I make artisan knives, entirely by hand in my workshop in Merida, Yucatan Mexico. Every knife is fashioned one at a time from high carbon or stainless tool steel, natural horns, tropical hardwoods and nickel and coin silver. I both forge and grind the blades by hand, and after rough shaping, they are hardened and tempered in a forge or furnace. Each is finely finished, but not overly polished: they're meticulously crafted but still show signs of the human touch; the decorative file work and carving are precise and carefully done, but you can also see that it was done by hand, not by machine; the lines are clean and true and pleasing to the eye, yet still alive - drawn with a pencil, not an app; the nickel rivets and silver embellishments show the marks of the hammer that I formed them with; and you can look at the knives and see how they were made and see that someone enjoyed making them; the knives speak of the place they were made, and of quality and care, and of good materials. Materials that are reflective of the places they were gathered from. They are subtle and they say all these things quietly. They're made to function and be used; or to be given as a gift to a friend to use. They're made to get handled and scratched, to get dirty and worn and polished by time. So they'll be more about you than they are about me. I began hand crafting knives more than thirty-five years ago, and in 1980, worked at the adobe forge of Don Primitivo Pablo Romano, a machete maker in Cualác, Guerrero Mexico. I am happy to be in Mexico again! Please check the Handmade Knives pages to see some representative examples of Kitchen, Folding, Hunting / Camp and Coin Knives. To see knives that can be purchased immediately, check the Available Knives page. If you would like to order a knife made with specific handle materials, options or etching, please refer to the Order / Options page. When in Yucatan, you're welcome to call or email to arrange a visit to my workshop.